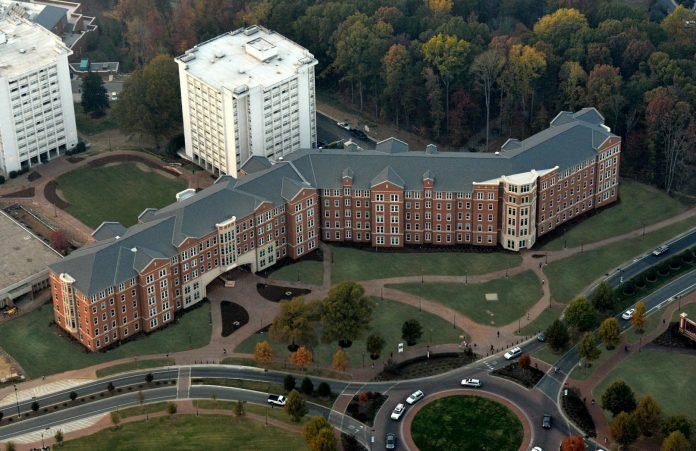 KWK Architects based in Webster Groves, MO, has been selected the design architect for a new residence hall at the University of North Carolina – Charlotte to replace existing Sanford and Moore Halls. Charlotte, NC-based Jenkins Peer Architects is the architect-of-record on the project. Sanford Hall (opened in 1969) and Moore Hall (opened in 1970), which each house 500 students and have 12 floors, will be demolished as part of the project. The new, proposed residence hall (currently referred to as Residence Hall Phase XVI) will feature 650-800 beds with double rooms supported by community bathrooms, lounges and laundry rooms on each floor, common areas and multipurpose rooms. The new complex will also be designed and built using LEED or Green Globes elements, and its exterior design will reflect the existing architectural style on campus. A two-phase demolition and construction schedule for the entire site is planned over a two year period, with construction of the new residence hall expected to begin in spring 2019. Two years ago, KWK Architects designed the university’s unique Levine Hall, which combines an honors program within a traditional residence hall.